An Australian and American ensemble based in San Francisco, the Angelo Duo is known for concerts that feature diverse musical styles. Alumni of the San Francisco Conservatory of Music (SFCM), Catherine and Anthony met at the Music and Arts Institute in San Francisco where Ross McKee first paired them as a piano duo. The duo was developed and refined at SFCM under the direction of the distinguished piano duo, Milton and Peggy Salkind. The Angelo Duo’s international career includes performances in Australia, England, Italy, Latvia, Lithuania, Russia, Ukraine, and the United States. The Angelos have toured Russia and other Eastern European countries six times and, on several occasions, they were the first American artists to perform for these audiences. The Angelo Duo’s 1999 tour to Eastern Europe was sponsored by a grant from The Fund For U.S. Artists At International Festivals funded by the National Endowment for the Arts/U.S. Information Agency. In 2002, The California Arts Council selected the Angelo Piano Duo as roster artists for their Directory of Touring Artists and, in 2004, Catherine and Anthony were the recipients of the Mill Valley Art Commission’s Milley Award for Achievement in the Musical Arts. Influenced by the artistic and cultural experiences of performing at international piano duo festivals in Europe and Russia, the Angelo Duo founded The San Francisco International Music Festival (Sfmf) in 2002. 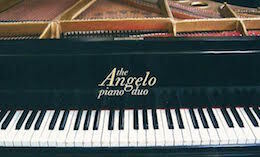 The Angelo’s vision was to establish a San Francisco based international festival that would capture the spirit of the Eastern European festivals and highlight the seldom-heard piano duo genre. The Milton & Peggy Salkind International Piano Duo Festival honors the legacy of the American piano duo, Milton & Peggy Salkind. To date, Sfmf has produced 5 successful Salkind International Piano Duo Festivals that have garnered critical acclaim in San Francisco and broad international attention. The Angelo Duo has recorded three CDs. The most recent is Helen’s Song, which features Bruce Cameron Munson’s concert arrangement for two pianos of jazz pianist George Cables’ “Helen’s Song.” Also included are works by Rachmaninoff, Piazzolla, Bolcom, Kokzhaev and Bizet. En Blanc et Noir (In Black and White) includes works for two pianos and one piano four-hands by Debussy, Grainger/Gershwin, and California composers David Garner as well as Bruce Cameron Munson. Brahms By the Bridge contains works for piano duo and vocal quartet, including both sets of Brahms' Liebeslieder Waltzes. The Angelo Piano Duo has been a featured guest artist numerous times on “West Coast Live” on KALW public radio and “West Coast Weekend” on KQED-FM, San Francisco. Performances have also been broadcast on Radio Riga, Latvia; in Novosibirsk and Borovichi, Russia; Public Educational Television, Thailand; RAI, Italy, and the Australian Broadcasting Commission. CD Project - "Helen's Song"
5th Salkind Festival - "A Baltic Voyage"
Salkind Festival - "A Parisian Fete"
For booking inquiries or other questions, please feel free to contact us! An Australian and American ensemble based in San Francisco, the Angelo Duo is known for concerts that feature diverse musical styles. This website built by GYST Media.